Roll Out The Bus Time Again In Ottawa! All aboard all who would dare to risk all on a dream! 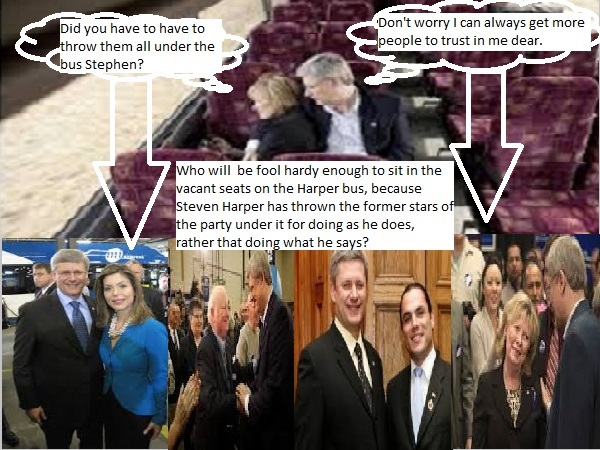 Everyone knows that it is roll out the bus time in Ottawa, because Stephen Harper needs to throw a few old friends under it. Dimitri Soudas is yet another high-ranking, inner circle, non elected conservative that Stephen Harper personally appointed and that Steven Harper has had to fire for inappropriate behavior. Dimitri Soudas may be making bad decisions, because of the love he has for Eve Adams, but what is the excuse for Stephen Harper’s constant lack of judgement in hiring and why does this keep happening to him and what has it done to the Conservative Party of Canada brand? Mike Duffy, Pamela Wallin and Patrick Brazeau are all Stephen Harper appointees to the senate; they are all under investigation and on suspension for breaking the rules of the senate. Bruce Carson former chief of staff of Stephen Harper forced to resign due to allegations of fraudulent activity in his past. Nigel Wright former Chief of Staff of the Office of the Prime Minister of Canada forced to resign over his roll in the Mike Duffy scandal. (d) Dimitri Soudas a former Director of Communications in the Canadian Prime Minister’s Office and former Executive Director of the Conservative Party of Canada has been just fired for inappropriate actions in a riding race in which his fiancée Eve Adams is trying to be the candidate. represent. I think that as a direct result of Prime Minister Steven Harper’s recognition that with the personal power given to him as the leader of a government with a majority government, Canadian laws, Canadian values as well as the rights and freedoms guaranteed to every Canadian in the Canadian Charter of Rights and Freedoms become moot and could be legally taken away, or at least sidestepped if they interfered with his vision of Canada, by simply changing them with his control in the House of Commons and Senate. In my opinion no other prime minister in the history of Canada has had the temerity of Prime Minister Steven Harper, or had such a loathing for what he thought it meant to be a Canadian internationally that he felt that he had no choice if given the power to change it to something unrecognisable to Canadians. I believe the problems in Canadian politics we are seeing right now are a direct result of Stephen Harper’s desire to emulate the USA and become as Americanized in every way possible. this has included gaining for Canada the reputation internationally of a warrior nation and in changing our socially conscious way of governing in Canada into the all for profit, everyman for himself business model type of government the USA uses, which exhibits little tolerance for social programs, or the running of honest and fair elections. In my opinion no other Prime Minister of Canada has been self-serving enough, or disapproving of Canada enough to take advantage to this extent of the well-known fact that once elected to parliament with a majority government a Canadian prime minister has almost limitless power and although it is non democratic, he and his government have the power to force legislation like Bill C-23 into law without debate, or even trying to reach consensus. Stephen Harper and the Conservative Party of Canada have used time allocation 61 times to limit the debate in the house of Commons on bills they wish to ram into law without a chance of hearing the good and the bad of them. this forces them into committee where the Conservatives say they will have a chance to be debated properly and at length. Once off the floor and into committee the Conservatives can control the vote because they have a majority in all committees and so can vote down any and all amendments. They accept no amendments to any of their bills now on principle and listen only to conservative friendly witnesses that agree with their point of view. Harper also has a majority in the senate turning it into not more than a partisan wing of his government than a non-partisan place of sober 2nd thought that it was intended to be. When the head of a political party ignores the spirit of democracy, laughs in the face of the courts, refuses to follow the laws of the land, or the rules governing their station and also ignores the intelligence of the average Canadian, I think that it is easy to see why the people under such a person, both elected and non elected like Eve Adams a conservative MP and her fiancée Dimitri Soudas would and could do the things that they are doing that they know are not right. Ask yourself this question, are Eve and Dimitri just star-crossed, ill-fated lovers, like Romeo and Juliet, or are they just 2 more self-indulgent, spoiled rotten Tories that think that they are above everyone else, following Prime Minister Harper’s lead of ignoring the laws of Canada, the rules of running a fair election and ignoring the will of average Canadians? It has been alleged that Eve Adams willfully did what she knows is against the rules of her party and has also violated the laws of the Canada Elections Act, by using her position and privileges as an MP to give herself an unfair advantage over her opponent and she did it out in the open like she had nothing to fear, just like her boss, Prime Minister, Stephen Harper. When as Canadians we look at the never-ending grabbing of power from agents of Canada that is then given to this government’s ministers and the total dismantling of governmental oversight as we are now seeing in the Fair Elections Act (Bill C-23), is it really that hard to understand that those doing the dismantling would dare to see themselves as invincible, unstoppable and all-powerful? This entry was posted in abuse of power, Canada, Government, Uncategorized and tagged Canada, Canadians, Conservative Party of Canada, Government of Canada, heavy handed tactics, politics, prodedure, Stephen Harper. Bookmark the permalink.